When you graduate from physical therapy school, you’ll likely receive all sorts of career advice. You’ll receive unsolicited advice from well-meaning PTs, family members, friends, professors, and a host of others. Deciding whose advice you should follow is difficult. Some say to pursue high-paying jobs to pay down loans. Others say to follow the mentorship opportunities to become the best clinician possible. Some others would say find a growing organization with leadership opportunities. More others may say to pursue autonomy, specialization, or variety in diagnoses. What if you could achieve all of this in a single setting? And what if that setting was one that you’ve likely never heard of? The outpatient on wheels setting just might be physical therapy’s best-kept secret, and it checks all of the boxes for an ideal work setting for new physical therapy grads. By offering flexibility, autonomy, mentorship, and generous compensation, the outpatient on wheels setting provides an ideal environment for new grads to enjoy the physical therapy profession. “Outpatient on wheels” is another way of saying “outpatient house calls.” This boils down to providing patient-specific, functional, outpatient therapy (additionally, occupational therapy or speech therapy) services in people’s homes. Yes, this is all real, and the outpatient on wheels setting is pretty incredible for PTs. One of the areas where outpatient on wheels stands out the most is its patient-centered care model. Meghan Fallon, PT, DPT, started her career with FOX in June 2016. A brand new graduate at that time, she had spent a clinical rotation with FOX and enjoyed it so much, she was determined to turn that clinical into a job. Dr. Fallon currently works in greater Philadelphia. She’s been pleased that the FOX team was very upfront with her regarding what to expect in her role. Examples of this include how much driving could be expected in a given week as well as the amount of time expected to be spent in assisted living facilities versus geriatric house calls. Janelle Carney, PT, DPT, who graduated from PT school in May 2016, also joined FOX following her clinical rotation. She was attracted to the outpatient on wheels setting because of the one-on-one care she could provide to clients. “It feels much more meaningful to patients when we are able to set goals that are realistic to their everyday challenges inside and outside of their homes,” she said. New grads sometimes shy away from in-home physical therapy as their first job. While they think that they will enjoy the autonomy to some degree, they feel some trepidation taking on so much independence so early in their careers. For this reason, new graduates often steer clear of the outpatient on wheels setting — which is a shame. The mentorship at FOX is simply top-notch. FOX’s mentorship program is more than your average, everyday mentorship program; it’s a formal six-month program with very clearly-defined expectations and structured education. Each participant has an assigned mentor and an on-boarding period that allows clinicians to ramp up to full caseload. Dr. Carney said that the outpatient on wheels setting has enabled her to offer more in-depth treatments and skill-specific training than she would if she had pursued home health. In addition, she feels that the frequency and length of her treatment sessions are more beneficial to her clients. Because of these specialized treatments — ones that are as specialized as you’d find in traditional outpatient clinics — mentorship is ever-important in the outpatient on wheels setting. During the first three months, a new grad starts with a caseload of zero clients, slowly ramping up to a full caseload. Each new graduate is assigned a physical therapy mentor. This clinician is dedicated to helping the new grad learn the documentation system, practice guidelines, clinical training, the flow of scheduling and visits, and the ins and outs of time management. Each new graduate gets plenty of one-on-one time with his or her mentor, which can be used for observation, Q&A, or general clinical growth work. Gradually, the hours with the mentor decrease, but the relationship remains ongoing. According to Dr. Carney, the program was incredible. FOX clinicians frequently report that their mentors become their friends, and that they have continued to ask them for advice and input on cases long after the program formally ends. For go-getter physical therapists like Dr. Carney and Dr. Fallon, performance-based reward opportunities are a must in any role they accept. Dr. Fallon chose FOX partially because of its Professional, Academic, and Clinical Excellence (PACE) program. The PACE program is designed to reward therapists for furthering themselves and/or the physical therapy profession in a number of ways. Back in 2015, I wrote an article about how to make the most money as a new graduate physical therapist. I recommended that energetic therapists who wish to hustle and make money should look for jobs where they could easily take on overtime hours — without being shamed for doing so. Quite a few employers look down on overtime. This can be because it makes employees more expensive. Yet if you have patients in need and therapists with loans, it makes no sense to look at overtime as something bad. Shamed? Perhaps that’s not the right word, but overtime hours aren’t cheap. So, many employers frown upon therapists taking on extra hours, even when their patients need the extra care. But FOX believes that, if a therapist is willing and able to provide extra high-quality care, overtime is permitted and embraced to allow for sick and vacation coverage so that clients can maintain their treatments per the plan of care frequency. This policy can be an absolute godsend for therapists who leave school with $100,000-plus in student loans. Dr. Carney often opts for cash to pay down her student loans. This policy allows for unprecedented flexibility. 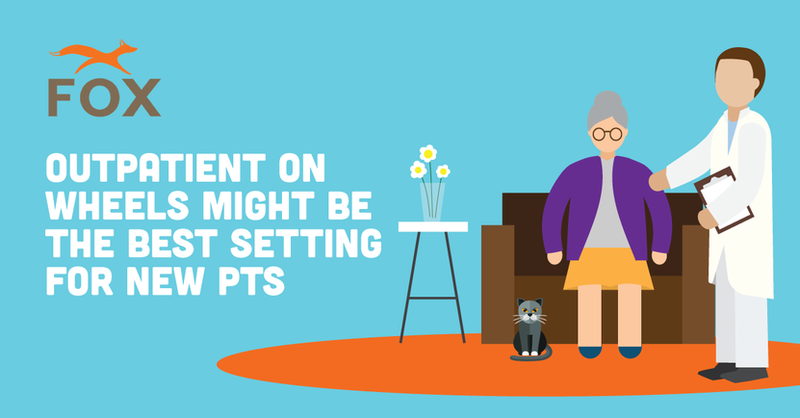 In many clinics, other therapists would love to step in and help out if a PT needs to take unexpected time off. But because they’re not supposed to go above 40 hours per week, they simply cannot help out. But with FOX, other therapists will often gladly step in when a PT’s schedule gets busy. They can opt to make some extra pay or simply bank hours for time off down the road. While it can be tough to decide exactly which path to pursue after graduation, FOX’s outpatient on wheels setting makes that decision a little bit easier. By touting flexibility, overtime opportunities, and a top-notch mentorship program, new graduate physical therapists truly can have it all.